Protica is pleased to announce that its healthy gummy candy, Protein Twist® is featured in the January/February 2012 issue of Candy and Snack Today Magazine. Twist is featured in the new products section of the magazine. Protein Twist is a one-ounce gummy candy with a similar taste and texture to the bear-shaped gummy candies consumed by children and adults every day. Unlike other gummy candies on the market, Protein Twist is sugar-free while still maintaining the same sweet taste of sugary candies. 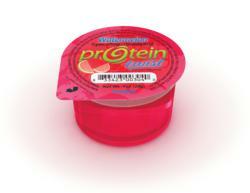 In place of sugar, Protein Twist contains 15 grams of protein, one full serving of fruit, and two grams of fiber. Protica hopes that this product will not only help people eat more healthy snacks but also help people lose weight. Protein Twist was designed to compliment weight loss diets, which advocate that dieters eat several small meals throughout the day, instead of three big meals. The idea behind these weight loss plans is that a consumer’s metabolism will burn calories more efficiently when it is constantly working to digest healthy foods. “One of my goals when creating Protein Twist was to create a snack that would help speed up the metabolism, which is why the candy contains 15 grams of protein and a serving of fruit. We want to change the way people eat, without them having to give up their favorite snacks like candy,” commented Jim Duffy, president and founder of Protica. Duffy hopes his nutrient-fortified candy will be the first of many snacks to provide healthy nutrition in foods that taste, look, and feel like foods consumers already enjoy eating. When discussing protein Twist, Duffy hopes it will help satisfy consumers’ cravings for candy with a product that provides necessary nutrients in place of sugar and calories while still tasting like candy. “I have two young girls, and they ask for candy all of the time. When I designed Protein Twist, I wanted to create a product that I could give to my kids and feel good about it -- they are eating something healthy. I’m happy because they are eating a healthy snack, and my kids are happy because it tastes like candy,” explained Duffy.